Our story -- our shared yearning to reconnect children to the natural world -- represents one of the few concerns in America that brings people together across partisan and religious lines. To change a society, as the philosopher Ivan Illich wrote, "you must tell a more powerful tale, one so persuasive that it sweeps away the old myths and becomes the preferred story, one so inclusive that it gathers all the bits of our past and present into a coherent whole, one that even shines some light into our future so that we can take the next step..."
So, today, how do we shine that light? We must continue to support the birthright of all children to a healthy environment and a connection to the natural world, and to teach the responsibilities that come with that right. We can work to reduce climate disruption and the biodiversity collapse by opposing policies that destroy people and the rest of nature, and by making the case that human beings protect what they love and love only what they know. More than ever, building a future generation of conservationists will depend on helping children and adults fall in love with the natural world. We can emphasize the healing powers of the natural world: for mental and physical health, for the capacity to learn and create, and for the reduction of violence. We can promote family nature clubs, and similar approaches, as ways to seek meaning and solace in a difficult and alienating time. We can offer a little Vitamin N for the soul through places of worship. And we can encourage pediatricians, psychologists and other healthcare professionals to prescribe nature. We can pursue "natural cultural capacity," illuminating the wealth of ways that different cultures connect to nature. We can reach out to people in the food movement, to community organizing groups in urban and rural neighborhoods, to military families and immigrant organizations. And as the human species continues to urbanize, we can strengthen our international efforts. We can seek solidarity in a movement that will grow, regardless of national politics. Worldwide, we can tell a new story of a nature-rich future to counter the post-apocalyptic vision of the future so widely accepted even before 11/8. Here is what we cannot do: heal every hurt or prevent every tragedy. But surely, in the words of the poet Aeschylus, we can do what we can, in the limited lifetime we have, to "tame the savageness of man and make gentle the life of this world." Politics can destroy the story, or our story can transcend politics. Richard Louv is co-founder and chairman emeritus of the Children & Nature Network. His books include VITAMIN N, THE NATURE PRINCIPLE, and LAST CHILD IN THE WOODS: Saving Our Children from Nature-Deficit Disorder. Follow him on Facebook and @RichLouv on Twitter. 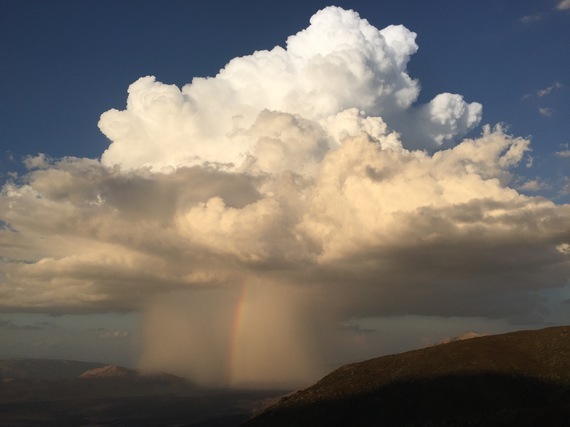 Photo: Storm over Anza-Borrego State Park, © R.L.